Orlando Magic guard E'Twaun Moore (55) reacts after he hit back to back three pointers against the Brooklyn Nets during the second quarter. ORLANDO, Fla. (AP) — The Orlando Magic finally are showing the patience in critical moments that coach Jacque Vaughn has been waiting for all season. The Magic fought off repeated challenges from the Brooklyn Nets, many of them in the final two minutes, to claim a 115-111 victory over a playoff-bound team. It was the second win a row where Orlando executed better than its opponent in the final minutes of a close game. "We’re continuing to learn at the end of games and not panic," Vaughn said. "I want these guys to enjoy what they do for a living. We come to work, we get better. That’s what we do." Arron Afflalo scored five of his 25 points in the final two minutes. Jameer Nelson was 4 of 4 from the free throw line in the final 13 seconds and Kyle O’Quinn had a key assist and block as Orlando made every play it needed to stop the Nets. Reserve E’Twaun Moore made all six shots, five of them 3-pointers, to tie his season high of 17 points. Tobias Harris added 16 points and eight rebounds. "We are better in close games and it shows the maturity and confidence we’re gaining as a group," Afflalo said. "The Nets are one of the hottest teams since the new year and we got good performances from a lot of our role players." The Magic needed a lot at both ends in the second half to stop a hot-shooting Brooklyn team that was making shots from everywhere. Joe Johnson led the Nets with 31 points, but had a potential game-tying 3-pointer blocked by Quinn with 10 seconds left in the game. Mirza Teletovic, who was 1 for 10 from the field in the first half, hit four 3-pointers in the third period to start the Nets on their way to 23 of 37 (62.2 percent) shooting in the second half. Teletovic finished with 17 points and nine rebounds. Mason Plumlee had 16 points and Marcus Thornton 13 off the bench for Brooklyn, which played without injured starters Paul Pierce and Shaun Livingston. "At the end, we executed offensively, but defensively, we didn’t," Nets coach Jason Kidd said. "We pretty much had five guards out there, playing Joe at the center. We probably put him in a bad way, trying to make a 3 on a 7-footer (O’Quinn). As coaches we can get better. This was a learning experience." The Magic led 107-101 after Afflalo’s 3-pointer with 1:58 left in the game, but Brooklyn cut it to 110-109 on a layup by Johnson with 14 seconds remaining. Nelson made two free throws for Orlando, then O’Quinn cleanly blocked a 3-pointer by Johnson with 10 seconds left. Nelson and Afflalo combined for three free throws to put the game away from there. The Magic led by as many as 16 in the first half and carried an 83-78 lead into the fourth quarter, but had to withstand some sharpshooting by Brooklyn in the second half. The Nets hit 23 of 37 shots (62 percent) in the final two quarters and got seven 3-pointers and four three-point plays, but it still wasn’t enough to overcome Orlando. The Magic kept pace with a hot-shooting second half of their own, making nearly 57 percent, and got key shots from Afflalo, Moore and Nelson every time Brooklyn got close. The Nets hit six 3-pointers, four by Teletovic, in the third quarter and Deron Williams and Kevin Garnett added three-point plays to help Brooklyn rally from a 55-43 halftime deficit. The Nets tied the game at 78 on a dunk by Plumlee with 35 seconds left, but Victor Oladipo countered with a perimeter jumper and Moore hit his fifth straight 3-pointer at the buzzer to give the Magic an 83-78 lead going into the final period. The teams traded baskets for the first 15 minutes of the game before Moore knocked down four 3-pointers to ignite a 20-3 run that helped Orlando to a 55-43 halftime lead. The reserve guard hit three straight 3s from nearly the exact same spot on the left side of the basket, then crossed to a similar spot on the right side and drained another. In between, he added a fast-break layup for 11 straight points, before being taken out of the game. NOTES: Magic C Nikola Vucevic missed his third straight game with a sore Achilles tendon. The Magic are 3-18 in the 21 games he’s missed this season. . The Nets said Pierce had a sore hip and Livingston a sore toe. . 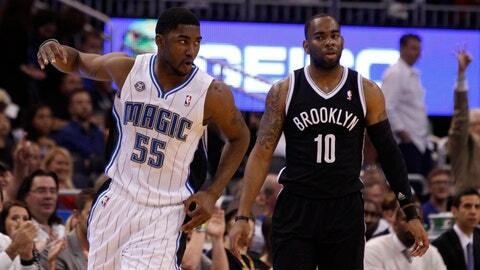 The Magic outscored the Nets 22-6 on fast-break points.